It is incredible! As I blog about the life of Pandavas in the forest, Bangalore Mirror talks of 'Forest Loot'. My first reaction was; 'The fear of rakshashas, if they were still around in the forest, would have surely prevented this loot'. Then it dawned on me that Rakshashas were known to change form at will! They now exist, unfortunately in the form of sleepy (pretending to sleep?) government officials and a mafia of middlemen and maufacturers. 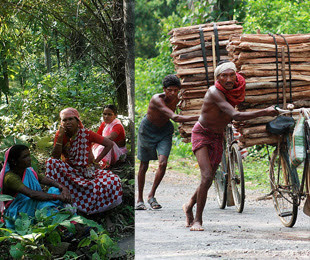 The tribals who get a pittance for their work. Draupadi is unable to contain her grief when she sees Krishna and her brother cries aloud: 'How is it that your friend, the wife of Pandavas and sister of Dhristadhyumna be reduced to this state? How is it possible that I was, scantily dressed as I was, dragged about? How could I be a 'daasi'? Am I not a daughter-in-law of Dhritharashtra? How is it the Pandavas kept quiet when I was being ill-treated? Shame on the most powerful Bheema and the very skilled Arjuna. Even mere weaklings try to protect their wives. They could have protected me at least for the sake of my five children?. Krishna after placating the Pandavas, goes back to Dwaraka, taking Subhadra and Abimanyu along with him. Dhristadyumna accompanied by the children of Draupadi and Drhustakethu and his sister Renumathi, Nakula's wfe, all return to their respective cities, leaving Pandavas and Draupadi all by themselves in the forest. Taking back Draupadi's children and others makes sense at the human level. But those of us, who are brought up with the stories of Krishna and his miracles, will wonder why Yudhisthira was not helped, while he was gambling away his life. Surely Krishna could have influenced the game of 'dies' from wherever he was. While these narrations did not say, it is said that it was Krishna who protected Draupadi from afar with a never ending supply of saris, so why not a miracle to help Yudhisthira? Kamala, probably anticipating such a question, does say in her version that Krishna had decided to punish the Khsatriyas and had set the events in motion. Interesting blog. Yes, the rakshasas are still there! Evolving the human race is the biggest mistake that Nature made. Wonder where it will all end.